As web hosting evolves as a service in a bid to cater to the needs of various customers, hosting providers are often asked about the peculiarities of every hosting service, cloud and shared hosting in particular. This query, asked by bloggers, web professionals and businesses alike, has often been a subject of discussion so as to come down to a better decision while choosing a hosting package. However, both shared as well as cloud hosting have their own characteristics which allow its deployers to make the most out of them. But having said that there are some shortcomings to them as well. This article aims to illustrate the difference between cloud and shared hosting and shed light on their pros and cons. Shared hosting is a type of web hosting service which allows many websites to share a physical web server as well as its resources among hosted websites. In a shared hosting package, ideally a server is split between multiple users and each user ends up sharing a specific amount of bandwidth. Hence, users share resources like RAM, disk space with other users. Think of it this way- you are living on rent in a house with your roommates. Since you are living in the same house, all resources present in the house will be shared by everyone living in it. Shared hosting functions in the same way. What are the advantages of shared hosting and when can it be used? 1. Shared hosting is easy to deploy – One of the major reasons it is used is, it reduces the time to get online drastically because of its simplicity in terms of deployment. 2. You are free of administrative responsibilities – This means your hosting provider pretty much takes care of all technical responsibilities (like the maintenance and upkeep of the server) and you need not necessarily have technical knowledge. 3. Cost-effective – Shared hosting is cheaper than other hosting packages. This again can be attributed to the fact that the resources are shared. 4. Easy management – You can avail cPanel, a web hosting management dashboard that allows you to manage your website or even download applications with the help of Softaculous. With Softaculous, you can download more than 300 applications and scripts with just a click. When can shared hosting be deployed? ◈ You have limited needs in terms of resources like disk space, RAM etc. What are the shortcomings of shared hosting? 1. Sluggishness – Since shared hosting jointly caters to a number of stakeholders, there is a chance that users may experience slow speed since other users request the same resources. 2. Server downtime – Since multiple requests are to be served, the server can get overwhelmed by the sheer number, resulting in a downtime or even crashing eventually. 3. Little or no control over features – You do not have much of a say when it comes to which features you want since you inevitably share the same features as other users on the server. This is how one can look at shared hosting as a service with respect to its pros, cons and in which situations it can be best deployed. Cloud hosting, on the other hand, is much different from its traditional counterpart. Let us look at what Cloud hosting is all about, shall we? Cloud hosting is a type of web hosting service wherein you can procure computing resources with the help of a cloud computing facility to host data, web services and solutions. You can use resources of multiple servers rather than restricting yourself to a single server location. In cloud hosting, it is the facilitator of the resources that oversees its set up, security and maintenance.These computing and storage resources are spread across virtual machines to help balance the compute loads. What are the advantages of Cloud Hosting and when can it be used? 1. Easy scalability – Since cloud hosting has a setup of a large stack of resources, it is easy for users to scale at large, that too quickly. This means as the requirement of a business increases over time with respect to web traffic etc. cloud hosting allows users to amplify and add more resources without any hassle. 2. Faster page load time – Deployers of cloud hosting experience faster page loading time because the hosting service integrates caching mechanism. 3. Storage space – The space provided by cloud hosting is immense. This is a major bonus for web professionals who want to build applications for their clients. Moreover, since the storage space is huge, cloud hosting deployers can also host multiple websites within the same hosting and control or maintain the same through a single cPanel. 4. Recovering lost data – Cloud hosting allows you to recover lost data with the help of backup mechanism tools. This primarily benefits users since data is stored in a different location i.e at data centers. 5. Saves operational and capital expenditure – Cloud hosting allows you to save major upfront costs because the hosting providers take the responsibility of maintaining the infrastructure. Hence, your deployment time, effort and eventually cost is saved. When can cloud hosting be deployed? What are the drawbacks of cloud hosting? 1. Platform dependency – Cloud hosting may limit some users by limiting them to one vendor, causing vendor lock-in. Major differences between the vendor systems can restrict users from migrating from one cloud platform to another, which can lead to increased costs. However, this problem can be countered by understanding what vendors are offering. Since most vendors use the same open source components, migration can also become easy. 2. Limited control and flexibility – Cloud Hosting providers’ policies and SLAs may sometimes limit users to varying degrees in terms of what they can do with the service. However, not every service provider imposes such a restriction. 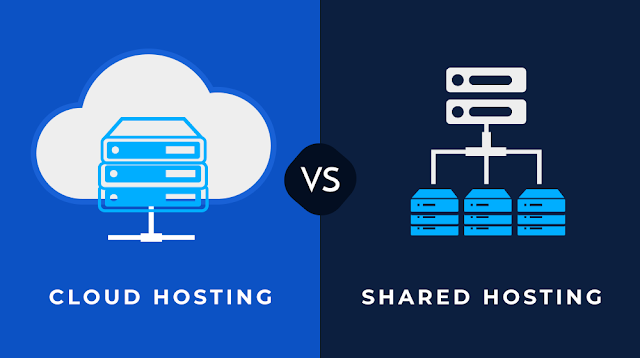 Before we begin with the differences, let us first understand that cloud and shared hosting serve different purposes although they are both web hosting services. Shared hosting is deployed when you want to quickly go online. Hence, as a user you don’t want a service that is expensive or time consuming. Cloud hosting on the other hand is more about configuring the right resources, deploying the right servers with proper disk space etc. So, keeping in mind the purpose that they serve, here are a some major differences based on the parameters of scale, security,traffic etc. Scale Limits the scale since resources are limited. Provides large scope to scale. Security Shared environment can increase susceptance to attacks but can be secured with SSH. Security is much better than shared environments with multiple layers of recovery options and anti-malware solutions. Traffic In shared hosting, websites cannot serve a large number of visitors at a time because they have a finite amount of processing power and storage capacity. With cloud hosting, websites can serve a huge number of visitors at a time since the storage capacity and processing power is much higher. Resources and Configurations With shared hosting, a server’s resources are divided to host a large number of websites. With cloud hosting, multiple servers pool resources together to host a large number of websites. Performance Shared hosting is not too fast as compared to cloud hosting for the simple reason that the number of servers deployed are less. Cloud hosting typically outperforms shared hosting simply because a large number of servers are deployed. Pricing This depends on the provider but shared hosting is usually cheaper than cloud hosting packages. Cloud is a tad bit expensive in comparison to shared hosting.